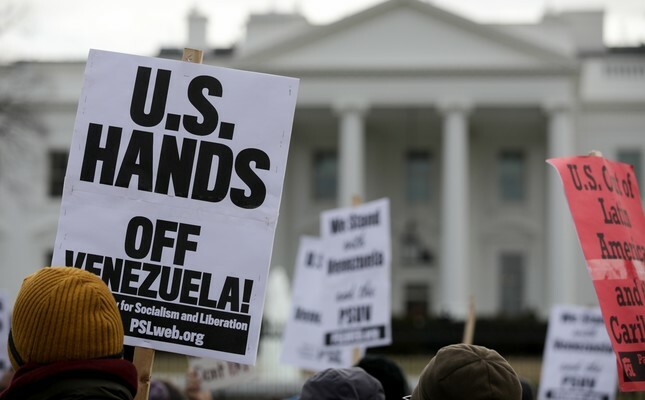 People attend a demonstration against the U.S.’s involvement in the coup attempt against Venezuela’s elected President Nicolas Maduro, in front of the White House, Jan. 27, 2019. COLUMNS Why did Putin reference the Adana agreement signed by Turkey, Syria? COLUMNS Who was behind the Manbij attack? U.S. President Donald Trump made headlines again last week – this time, over a political crisis unfolding in Latin America. On Jan. 23, the White House officially recognized Juan Guaido, the president of the Venezuelan National Assembly, as that country's interim president. Trump added that protests against Nicolas Maduro, who won the elections in May 2018 and took the oath of office as president just two weeks ago, were a demand for "freedom and the rule of law." It is no secret that Washington has been unhappy with Venezuela's overall direction since Hugo Chavez came to power in 1999. Trump himself adopted a hawkish position on Maduro and even talked about potentially occupying the country. As such, it was hardly surprising that the United States and Latin American nations, with the notable exception of Mexico and Bolivia, supported Guaido, who declared himself president on Jan. 23. After all, senior members of the Trump administration, including Secretary of State Mike Pompeo, National Security Adviser John Bolton and Sen. Marco Rubio had been tweeting that they recognized the Venezuelan opposition leader as the country's legitimate ruler. By the time Canada, the European Union, France, the United Kingdom, Portugal, Spain and Latin American nations endorsed Trump's statement; everything was already in place for regime change. Washington's anti-Maduro stance clearly paves the way to civil war and a military coup in Venezuela. Guaido, the opposition leader, was quick to get the message and announce that he would pardon military commanders if they attempted to overthrow the elected president by force. It was also noteworthy that Bolton pledged to ensure that Venezuela's oil revenue would flow to Guaido rather than Maduro, provided that oil accounts for most of the country's revenue and Venezuela has been experiencing a very serious economic crisis. Under the circumstances, losing oil revenue could put the Maduro administration, which is already fighting an uphill battle against hyperinflation, in a difficult position. Unlike the 2017 protests, the current uprising receives some support from Maduro's lower-income base. Although the government rejoiced at statements of support from Turkey, Russia, China, Mexico and Greece, the economic sanctions, at which U.S. officials hinted last week, could potentially start a civil war in Venezuela. Under Trump's watch, the international system evolved into a platform, on which power struggles take place in plain sight. Many countries no longer feel compelled to hide their violations of "universal norms." As such, Trump himself has no problem adding another coup to the long list of Washington-backed military interventions in Latin America, which the U.S. has treated like its backyard since the adoption of the Monroe doctrine. In this sense, he follows in the footsteps of past presidents who overthrew the elected leaders of Guatemala in 1954 and Chile in 1973. Although Trump tries to sell the American people on regime change with references to freedom and the rule of law, his justification is hardly as effective as George W. Bush's stated goal of democracy promotion in the Middle East. President Recep Tayyip Erdoğan was the first foreign leader to oppose the coup in Venezuela and this surprised hardly anyone. Erdoğan's call on Maduro to "stand tall" reflected a sense of solidarity, since the Venezuelan leader expressed solidarity with Turkey during the July 15, 2016 coup attempt. At the same time, the Turkish leader stressed the importance of the ballot box, "Maduro won an election. Coming from someone who believes in democracy, Trump's statement was shocking to me." To criticize Turkey's support for Nicolas Maduro by providing a list of the Venezuelan leader's mistakes would be a meaningless effort. Trump and his allies do not call for reconciliation or reform. They only encourage coup plotters and threaten to start a civil war.